What percentage of goods do you think travel by sea? What percentage of goods do you think travel by sea? DP World Australia container terminal, Port Botany, photo Glenn Duffus, 2015. Reproduced courtesy DP World Australia. Shipping accounts for over 99% of Australia’s total merchandise trade by mass. A staggering 7.8 million containers move through Australian ports each year. In today’s global world you may have had coffee from Brazil or a smoothie containing frozen fruit from China. 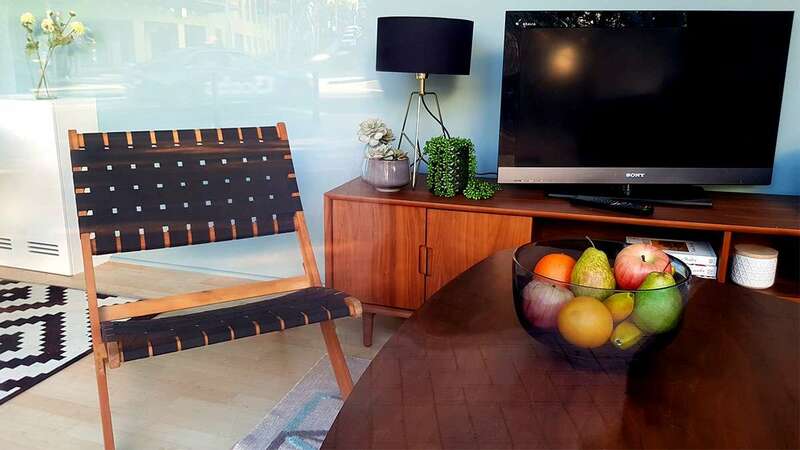 You could be wearing clothes made in India, watching a TV made in Japan while sitting on a sofa containing wood from Argentina on a laminate floor manufactured in Sweden. 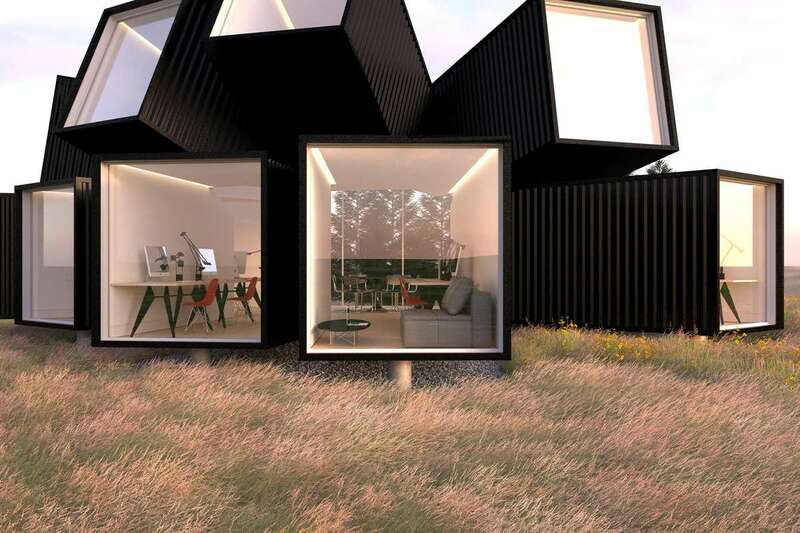 All of this has been made possible by a rectangular steel box – the humble shipping container. The box which fundamentally transformed the world is the shipping container, pioneered by US trucking magnate Malcom LcLean in 1956. 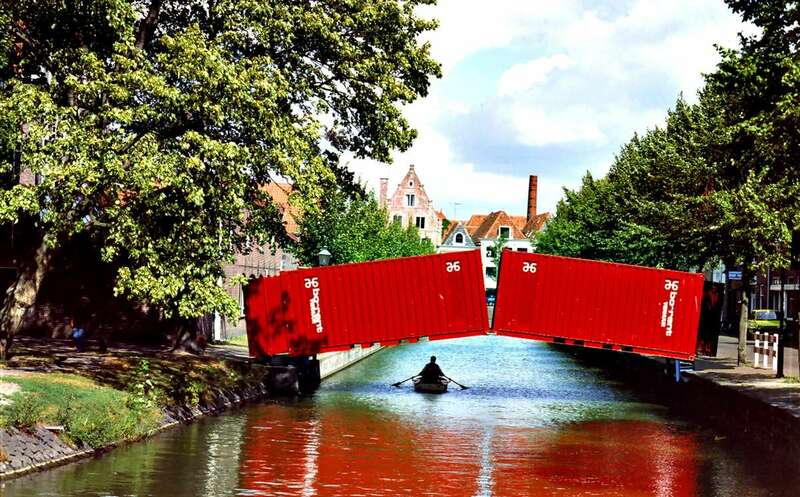 Containers – simple steel boxes – enabled huge efficiencies in cargo handling and capacity, slashed travel time, all reducing the cost of transporting goods, especially in a globalised world. 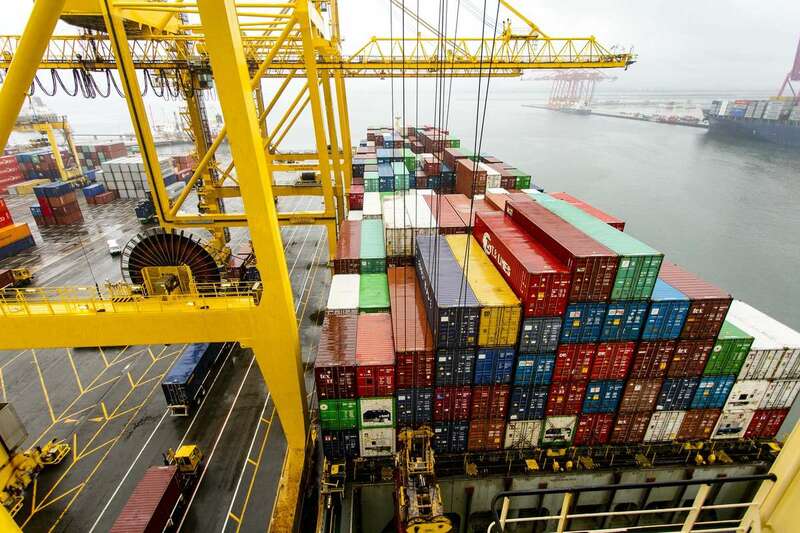 Containers are the drivers of a global economy. 19,000: Number of containers the largest current container ships can transport at any one time. Global demand for seafarers increased by 45% between 2005-2015. There are 1.5 million seafarers worldwide. An officer will spend around 5 months at sea. Only 14 seafarers are required for a modern container ship. General cargo ships need a crew of 50. 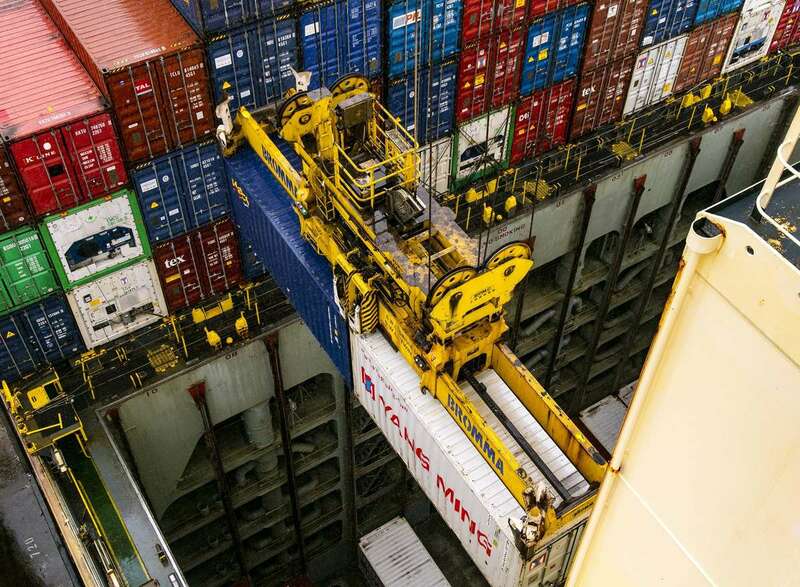 Containerisation brought with it a radical transformation of ports and port cities worldwide. 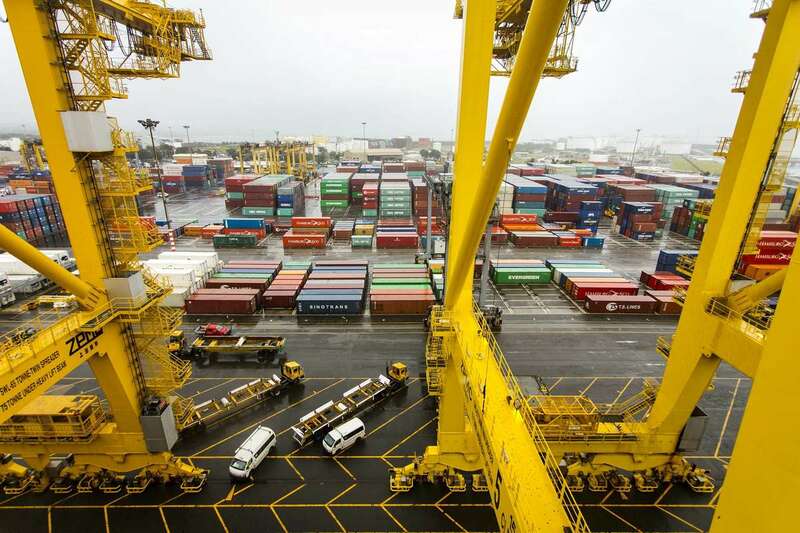 A new breed of port – the container terminal – was born. 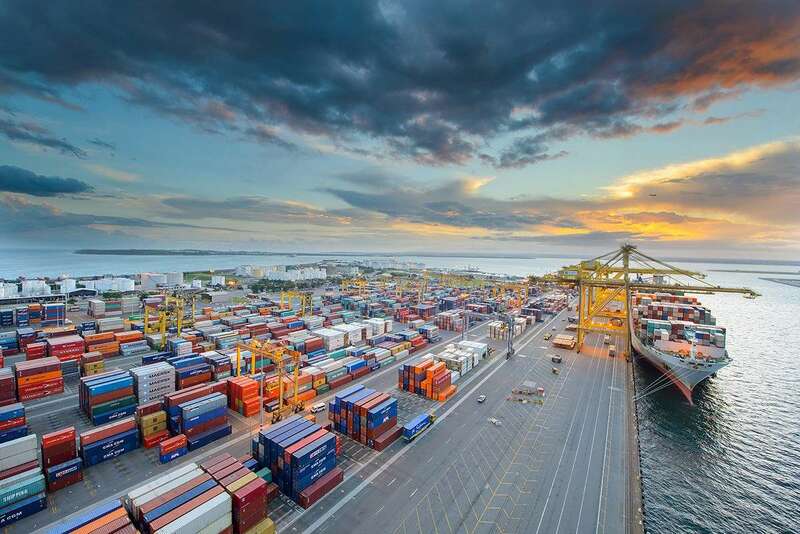 Ports moved further from commercial centres, branching out via inland depots and transportation networks to now-decentralised industrial, production and distribution hubs. In 2015 the world’s top 100 container ports handled 539 million containers. In 1975, it was a mere 17 million containers. Over 99% of Australia’s international trade and about a quarter of domestic freight moves through our ports. 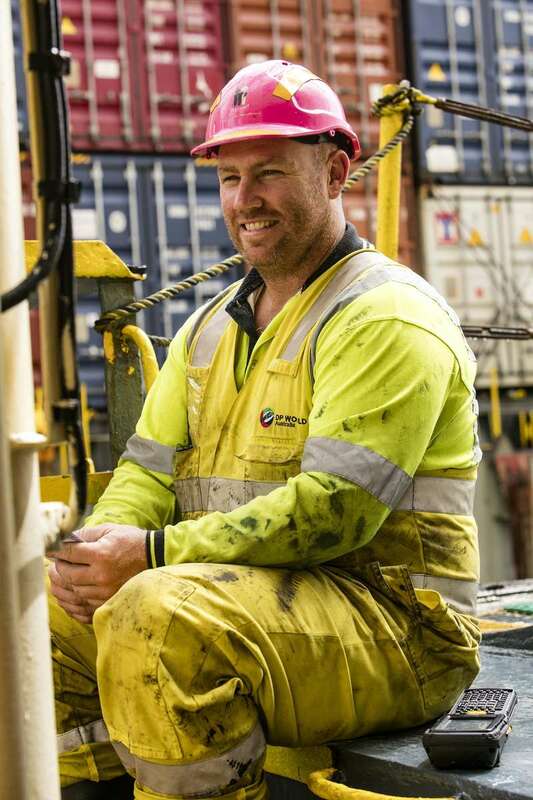 Australian ports currently handle around 7.8 million containers each year. 20 million: The number of containers travelling through our ports each year by 2033. One of 999 boxes being unloaded from the Yang Ming Singapore. Image: Andrew Frolows/ANMM. The containers waiting on the terminal, amid the gantries. The scale of the container terminal is awe-inspiring. Image: Andrew Frolows/ANMM. The scale of the container terminal is awe-inspiring. Image: Andrew Frolows/ANMM. DP World staff at Port Botany. Image: Andrew Frolows/ANMM. Port Botany never stops. 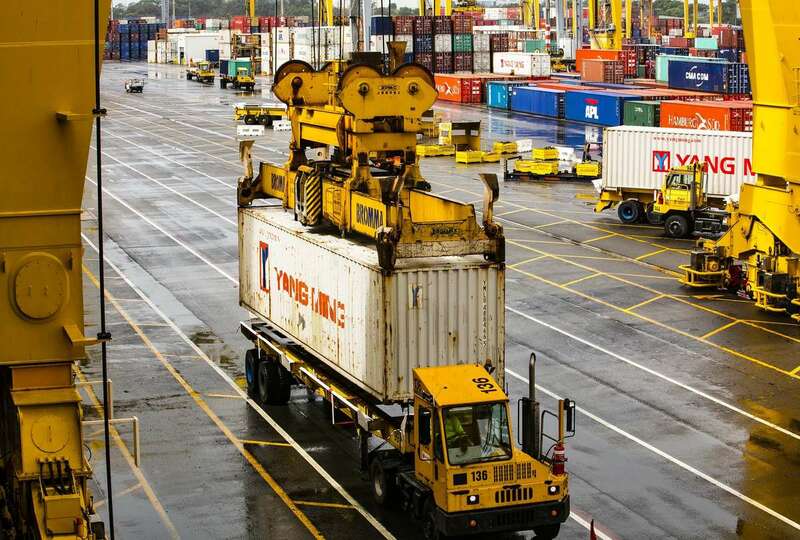 The crews, mini buses, trucks and the impossibly large rubber-tyred gantries move swiftly to load and unload the hundreds of containers passing through the terminal each day. Image: Andrew Frolows/ANMM. The total number of kilometres travelled by sea by all the personal products in this model living/dining room is a staggering 87,082 km – that’s about two-and-a-half times as long as the distance from Earth to the moon. 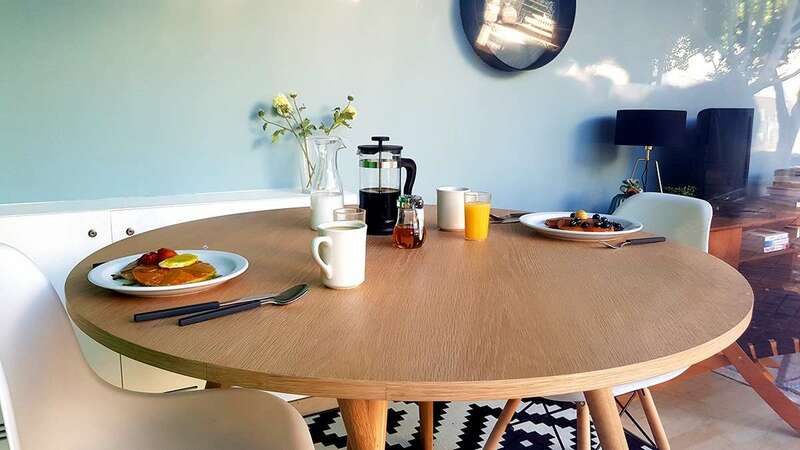 The total number of kilometres travelled by sea by all the personal products in this living/dining room 87,082km – that’s about two-and-a-half times as long as the distance from Earth to the moon. Cutlery and plates: Produced in China and would have travelled to Australia via the Chinese ports of Shanghai and Shekou. Total distance by sea: 8, 412 km. Vanilla essence in the pancakes: Made in Australia with vanilla beans from Madagascar, travelling from South Africa, through China and on to Australia. Total distance by sea: 41, 881 km. Woven chair: The acacia wood was probably grown in South East Aisa and shipped to China via Singapore for assembly. The Nylon strapping could have been produced in China. Total distance by sea: 13, 477 km. 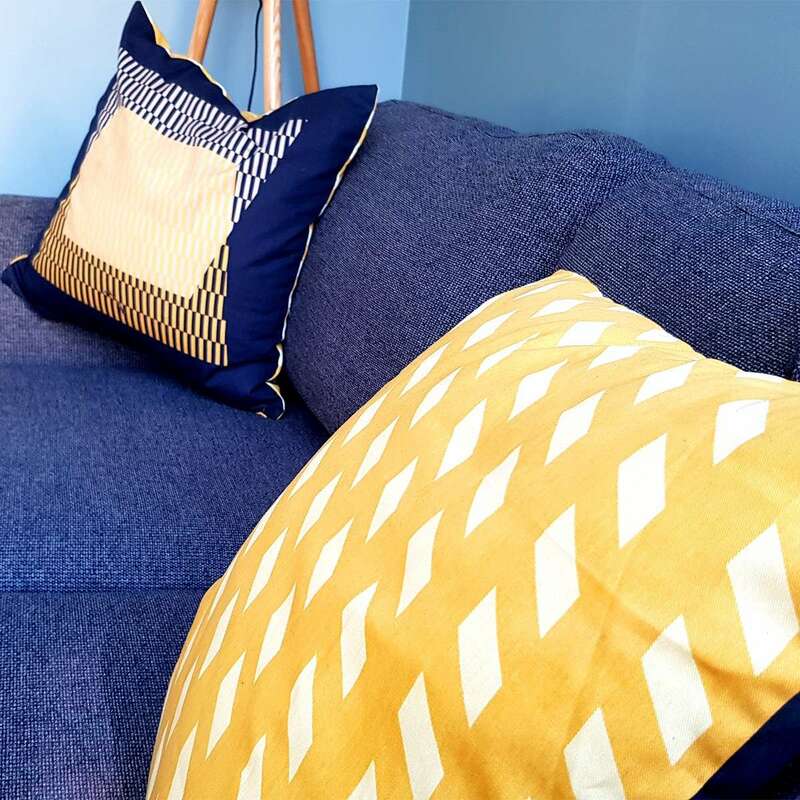 Cushions: Covers made from sustainable-cotton and polyester in India. Polypropylene and polyester filling made in China. Shipped separately, the cover came to Australia via Sri Lanka and Taiwan. The insert came directly from China. Total distance by sea: 23, 363 km. Laminated flooring: Made from fibreboard, melamine foil and paper. Manufactured in Sweden. Total distance by sea: 27, 874 km. 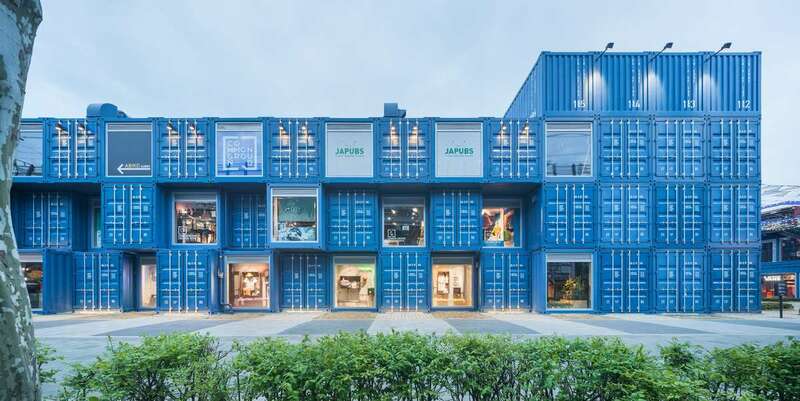 With a working life of around 10 to 15 years and the number of containers in use increasing each year, recycled shipping containers are fast becoming the sustainable building blocks of the future. Bridge, Hoorn, The Netherlands, architect Luc Deleu, photo Wim Riemens, 1990. Reproduced courtesy TOP office. Copyright SABAM. Side view of the Common Ground Mall ‘street market’ in Gwangjin-gu district, Seoul, photo Kyungsub Shin 2015. Reproduced courtesy URBANTAINER Inc. 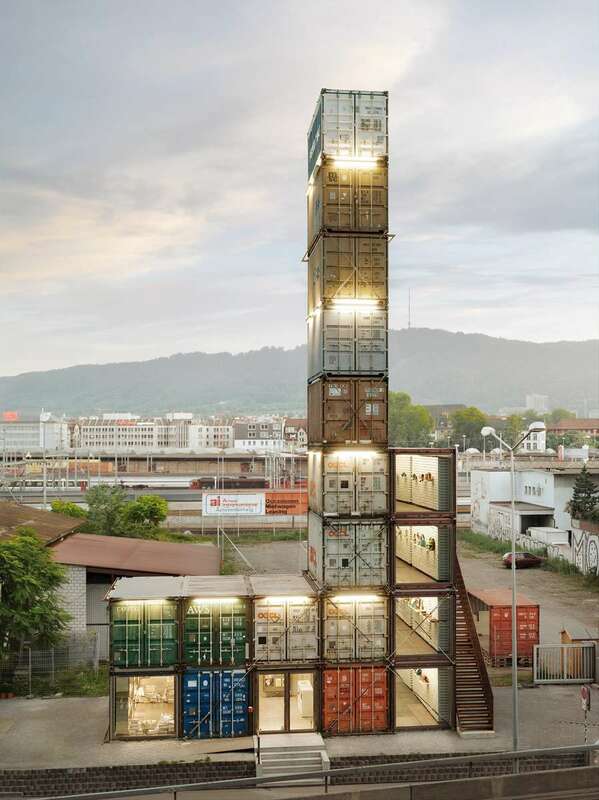 The Freitag Flagship Store, Zürich, architects spillmann echsle architekten, photo Roland Tännler, 2012. Reproduced courtesy spillmann echsle architekten ag. 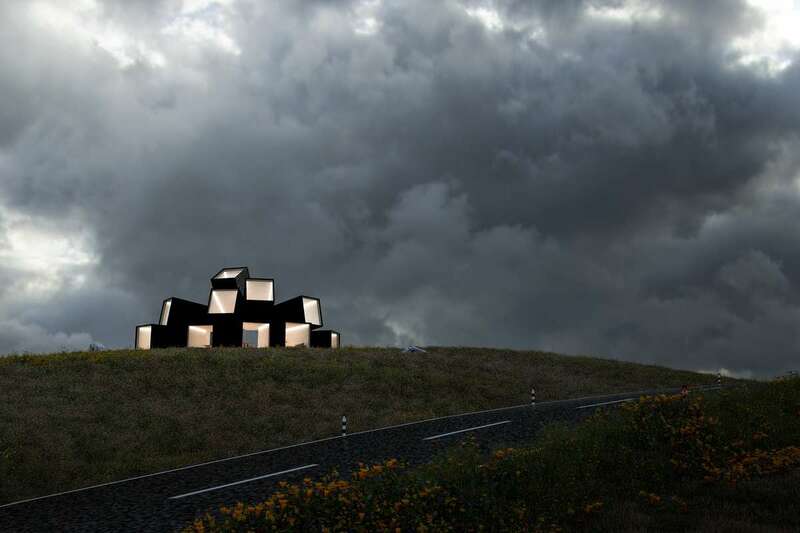 Architect’s render of the proposed Hechingen Studio, architect James Whitaker, 2010. Reproduced courtesy Whitaker Studio Limited. Hechingen Studio render, architect James Whitaker, 2010. Reproduced courtesy Whitaker Studio Limited. UN mobile field hospital, Somalia, photo Zeppelin Mobile Systems, 1993. Reproduced courtesy Zeppelin Mobile Systems. 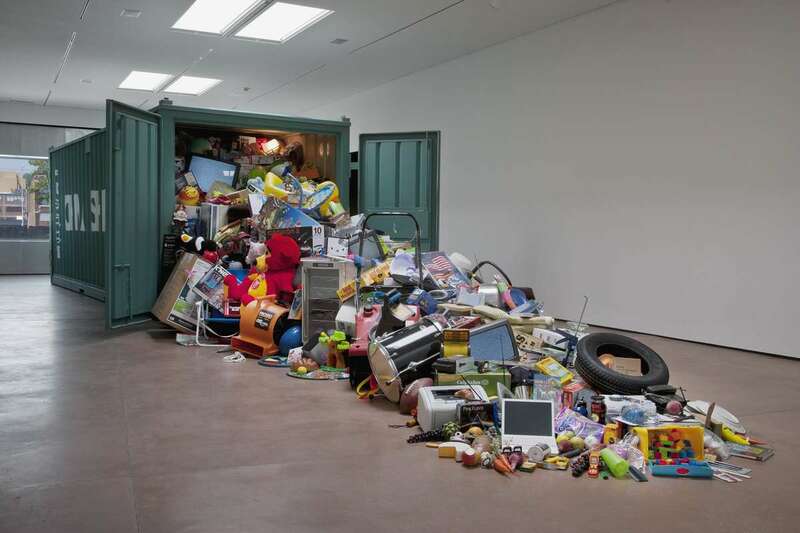 New Cornucopia asks ‘Do we really need all this stuff?’ Grad Arts, Kansas City, artist John Salvest, photo EG Schempf, 2011. Reproduced courtesy John Salvest. 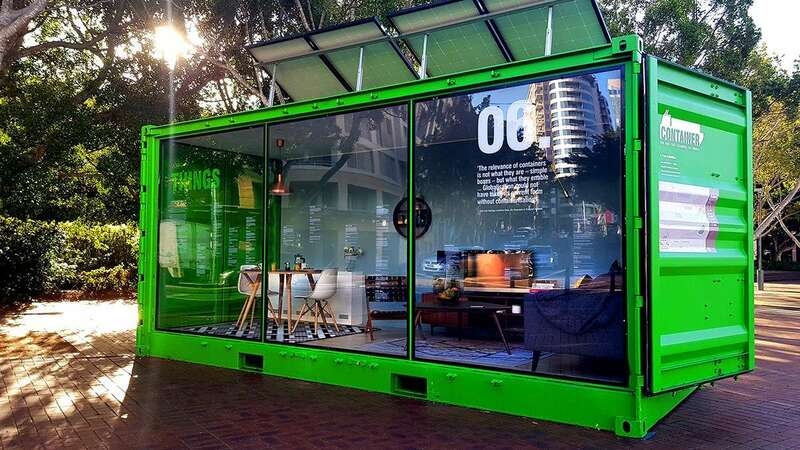 From tiny eco-homes to grand designs, containers have been transformed far beyond their original purpose – the transport of goods by road, rail and sea. Today, a container can be a swimming pool, a data centre, an emergency field hospital, temporary housing, a gallery space, a work of art and even a pop-up cafe, like Kanfeh in Sydney. — Kate Pentecost, Digital Curator, with Dr Mary-Elizabeth Andrews, Project Manager & Curator of Container. Step inside the box Container: The box that changed the world, on tour at Wagga Wagga, NSW, 2 February 2019 – 5 May 2019.